zSpace is a company that has quietly been spreading its influence in virtual learning and education. Recently I got to try it out again and I remember trying out their product about a year ago at a conference, being somewhat impressed but mostly distracted by the shiny new head-mounted-displays (HMDs) like HTC Vive and Oculus Rift. 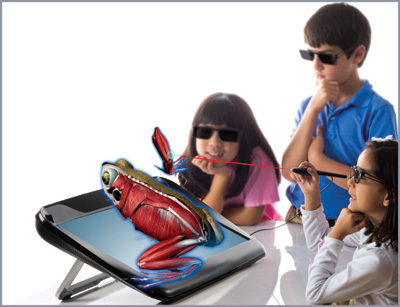 Rather than the usual large bulky VR headset, zSpace utilizes a pair of special tracking glasses, a large 2D screen, and an interactive pen to provide students with a virtual learning experience. I wouldn’t go so far to call it VR, since you’re not being fully immersed in a new reality, but it is certainly a virtual environment. From the presentation I saw, zSpace claims to be in over 400 schools and universities. 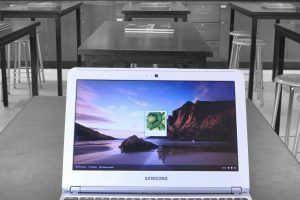 They don’t provide single devices to schools but instead have packages that include professional development, tech support, and usually between 10-20 devices. According to the zSpace representative, this could set a school back approximately $22,000. This seems like a lot but remember, to get a single HTC Vive or Oculus Rift setup it’ll cost about $2,000 when you factor in the headset and the computer hardware. 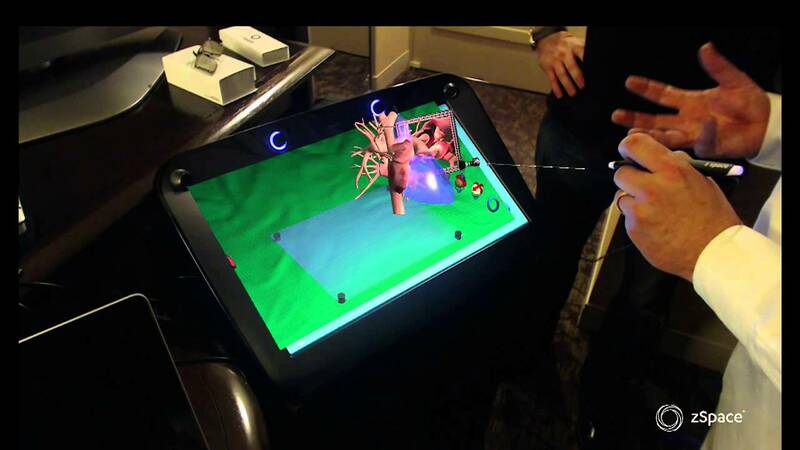 Most of zSpace’s built-in apps focus on science. Newton’s Park seemed like a cool physics tool to try out. 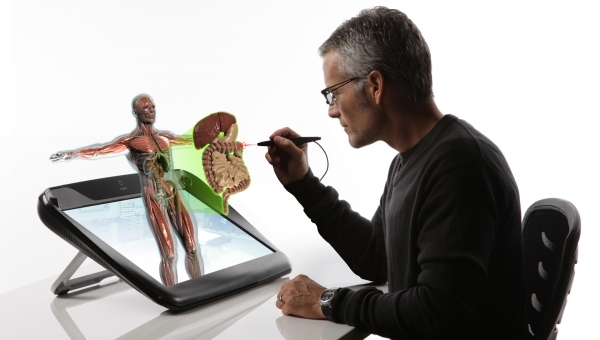 There are also chemistry, anatomy, and biology-related apps that take advantage of zSpace’s primary interactive tool, the pen. Anyway, there are plenty of articles out there about zSpace so I won’t go over the same angle as them. From the VR for Ed perspective, how does zSpace stand up? The Pen: The user interface is intuitive and even though the pen would be lost to tracking more often than I would prefer, it was relatively easy to adjust to the invisible boundaries. Using the pen to manipulate items is an semi-effective way of learning through embodied cognition but it still feels a step removed from the haptic feedback VR controllers can offer when you “hold” something with them. There is a level of surgeon/doctor-like feelings you get when using the pen tool. Its like delicately using a digital chopstick to interact with the world. For some this is a great way to pick up items and “touch” everything. Others prefer to “get their hands dirty” and to use more gross motor skills. Learning as a group: zSpace says two students to each screen is the best ratio when you can’t to 1:1 but I think you could easily up it to 3 per device. The advantage of zSpace over headsets like Vive and Rift is that it has a built in screen to show others what the participant is doing. Yes, VR headsets do show what the user is seeing but there is a greater level of isolation from others around you. With zSpace, the user sees a slightly different perspective from the bystanders but it isn’t so different that they can discuss or collaboratively work together to interpret what is being seen. The social factor is important and is a problem that full VR hasn’t solved yet. 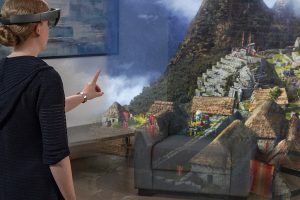 Easier transition than full VR: On the practical side of things, zSpace is simply less of a unknown to educational institutions than full VR is. Its appearance is similar to Mac computers most schools have, the pen is basically a large stylus-looking device that is familiar, and the glasses are not crazy futuristic headsets that make you look like the eye-less beast from Pan’s Labyrinth. Judging from zSpace’s foothold in the educational world, it is clear that it is currently a more favorable option than full VR experiences. Their apps are more fully developed than most VR science apps I’ve seen but they are also firmly entrenched in a setup that is slowly being left behind or ignored completely. However, this actually works to their advantage that many others are skipping the large screen, tracking glasses setup and jumping straight to full VR experiences. In the short run, they can push a product that schools and institutions can wrap their heads around while the educational VR space takes its time to mature. The question is, how long will that take? Immersive VR Education's new program, Lecture VR, is a great step toward virtual reality classrooms. Teachers can lead students through immersive environments while lecturing, and students can be anywhere in the world.